Anna is a native of the MS Gulf Coast and began her nursing career in 2010. She worked in various hospital settings as a nurse, however, her favorite specialty has always been oncology. She earned her Master’s Degree in Nursing in 2016 from the University of South Alabama and is board certified in Family Practice. After 1 year of working in primary care, she happily joined The Medical Oncology group to pursue her passion for the oncology profession. What inspires you most in this profession? It is truly inspiring to see how resilient people can be during the most challenging times. Oncology patients are so strong! They are like no other. ​Anna assists Dr. Pande in the care of his patients. 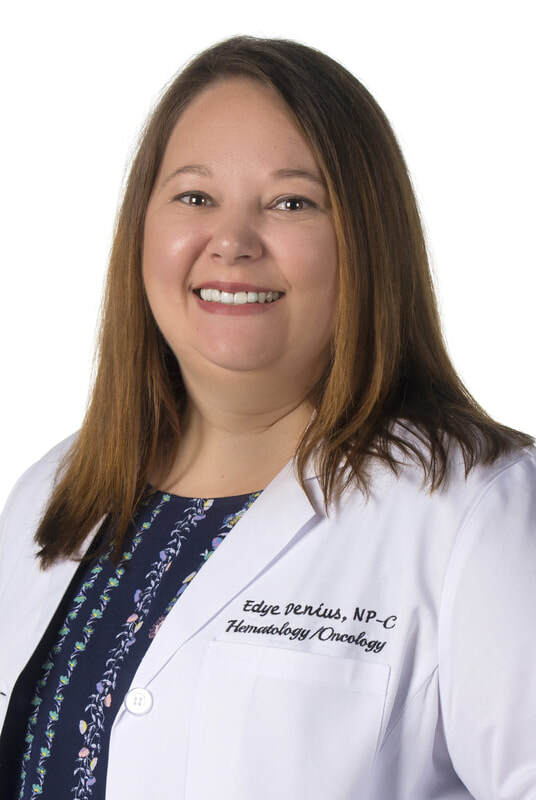 Edye, a native of Poplarville, MS, received her Master’s Degree in Nursing from the University of South Alabama and is Board certified as a Family Nurse Practitioner. She has background in intensive care nursing. She has practiced for the last 8 years in family practice clinic and hospital medicine. She joined The Medical Oncology Group in 2017 and provides care to the hematology and oncology patients mainly in the inpatient setting. ​Why did you choose the oncology field? She chose to transition to hematology/oncology field because of the rewarding relationships with patients and their families during such a difficult time. Lauren graduated from the University of Southern Mississippi with a Bachelor’s Degree in Nursing in 2010. As a nurse she has practiced in Cardiac and Surgical Intensive Care, Surgical Services, and Family Practice. She then extended her education by attaining a Master’s Degree in Nursing and becoming a certified Family Nurse Practitioner. She joined The Medical Oncology Group in September 2016. She is also a wife and mother to two young boys. Since she was a teenager, she has been interested in oncology after her aunt was diagnosed with cancer. Lauren assists Dr. Tuli in the care of her patients. Michelle Holt started her career at the University of South Mississippi with a Bachelor of Science in Nursing in 2008. Early in Michelle’s career, her mother was diagnosed with lung cancer which led Michelle to specialize in Oncology/Hematology. After working as an oncology nurse, she decided to further her career by perusing her Masters of Science from the University of South Alabama. She became a Board Certified Family Nurse Practitioner in 2016. Michelle is an avid patient advocate with a focus in practicing medicine while using holistic approaches whenever possible. She is honored to serve as a patient advocate to ensure quality care and comprehension between the patient, family members and members of the healthcare team. ​​Michelle assists Dr. Pande in the care of his patients.